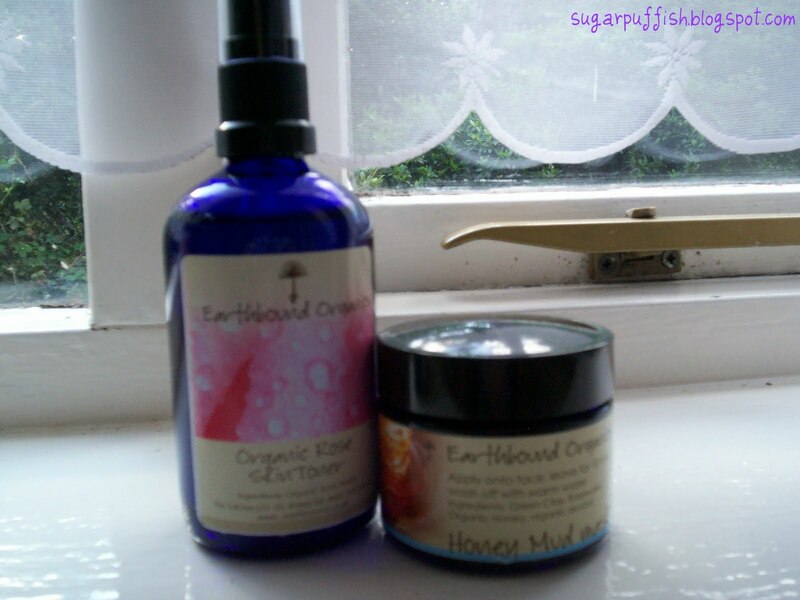 Earthbound Organics is based in Wales and some of the ingredients are handpicked from the Welsh countryside. There are no chemical nasties in Earthbound products. I came across the website whilst browsing online and asked if I could review some products. I was sent Organic Rose Toner, Honey Mud Mask, Jojoba & Vitamin E cream and Chickweed & Calendula cream (ideal for eczema). I have enjoyed using the Honey Mud Mask. My BF found it rather amusing his first comment when he saw me wearing it was “I didn't realise you had joined the SAS”. The mask contains green clay, rosewater and honey. It is a bit messy but that is to be expected and it dries out with a tightening effect. I normally use a moisturising mask (e.g one that is absorbed into the skin) so this was a change for me. As the mask dries you can feel your skin tighten. When I removed the mask my skin was soft and refreshed. I personally do not think it is a product I would purchase for myself but if you like the effects of a mud mask this would be one to consider. I was not able to test the Jojoba & Vitamin E cream as it contains orange oil (one of my allergies) so I gave it to Ickle Sugarpuffish (my sister) to test. Here are her thoughts……"When I first opened the pot the cream reminded me of butter icing. The texture is soft to the touch and fragrance has a lovely hint of citrus. It absorbed straight into my skin leaving no sticky residue. My face feels so soft and I even used it all over my body. This is a fantastic cream and great value for money. I will be buying this cream for myself." The Chickweed & Calendula Cream has been pleasant to use. For clarification I currently have mild patchy eczema with unbroken skin but I was previously using another product which produced good results. I cannot decide whether this cream is having an effect on my eczema but it certainly is not doing it any harm. I have passed the product onto my best friend who has eczema and I will report back at a later stage with her thoughts. 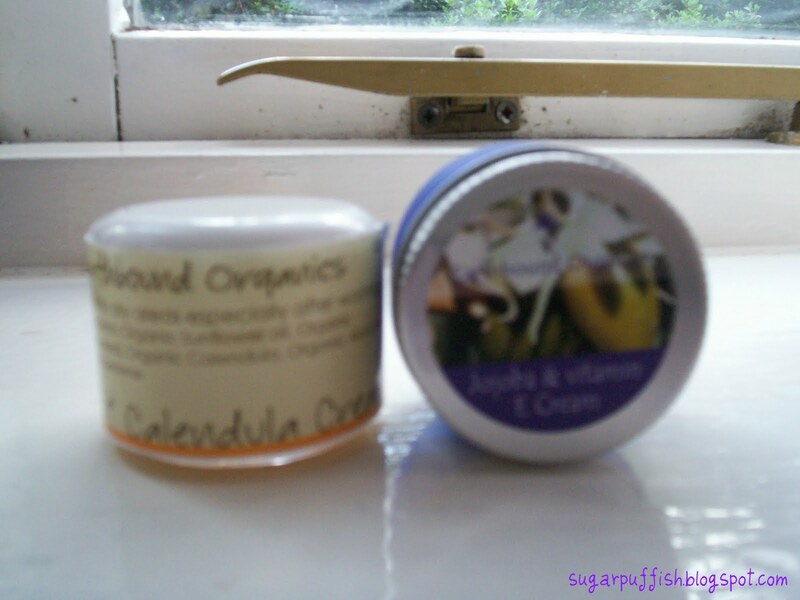 Overall Earthbound Organic products have been a pleasure to use. My one criticism is I found the fragrance of the mask and toner a little overpowering for my senses. Disclaimer – I was sent these products free of charge, all opinions are my own and I am not being paid to do this review or to promote the website/product. The mask really sounds good. I love your sister's review of the Jojoba and Vit E cream, butter icing... must be really soft!